Our favorite foods at parties usually involve the appetizer table, specifically the dips. What can we say? Dips are always yummy (except some pesto hummus we made a few weeks ago that tasted like grass…disgusting). 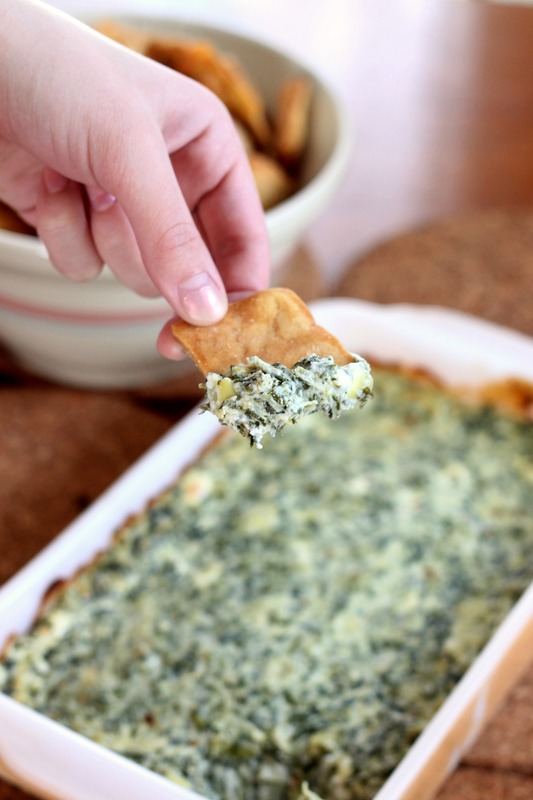 Spinach dip has always been one of our favorites. 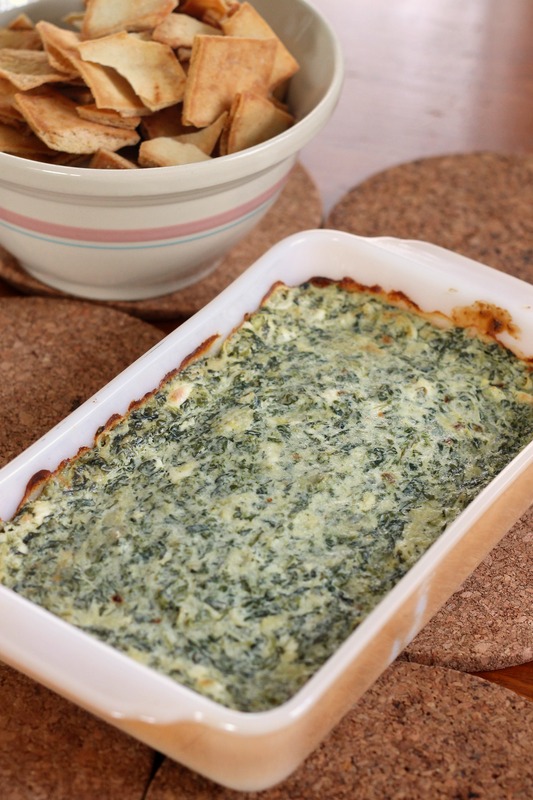 Looking for a great spinach dip recipe? Look no further! This one did not disappoint. It has fantastic flavor thanks to roasted garlic (which smells amazing while it is cooking, by the way). Also, it has freshly grated Parmesan cheese, which makes everything delicious. But the best thing (to us) about the dip is that we could actually taste the spinach and artichokes! Some picky people might not count that as a plus, but if it’s called spinach dip, it really should taste like spinach, right? This dip is bound to go quickly, so make a double batch if you are feeding a crowd. Everyone will love it! Preheat the oven to 350˚ F. Place the unpeeled cloves of garlic onto a baking sheet or pan. Bake for about 25-30 minutes. Let cool, and either put it through your garlic press or smash it. It gets pretty soft, so you don’t have to worry too much about how you chop it up. Bring up the oven temperature to 400˚ F. In a medium bowl, combine the cream cheese, Parmesan, Greek yogurt or sour cream, mayonnaise, spinach, artichokes, roasted garlic, salt and red pepper flakes. Mix well with a rubber spatula until all ingredients are evenly blended. Spread into a small baking dish. Sprinkle additional grated Parmesan over the top. Bake for 35-40 minutes or until the top is slightly browned. Serve warm with pita chips, crackers, or baguette slices. Enjoy! Note: if you use all lower fat options, your dip will likely be slightly less creamy. It will still be delicious though! We recommend maybe using lower fat for only one of the dairy products, and using the rest full-fat. Do whatever you would like!